How does the Connection Management as part of the Handling Unit System work? metasfresh enables you to keep track of a product not only as in stocked amounts but it is also possible to map in which form the article is. As an example a product can be represented as e.g. 10 pieces in a box where as there are 20 boxes on one pallette. To map a product (customer unit = CU) with its packaging (Transport Unit = TU) and its aids used in loading is called Handling Unit System. 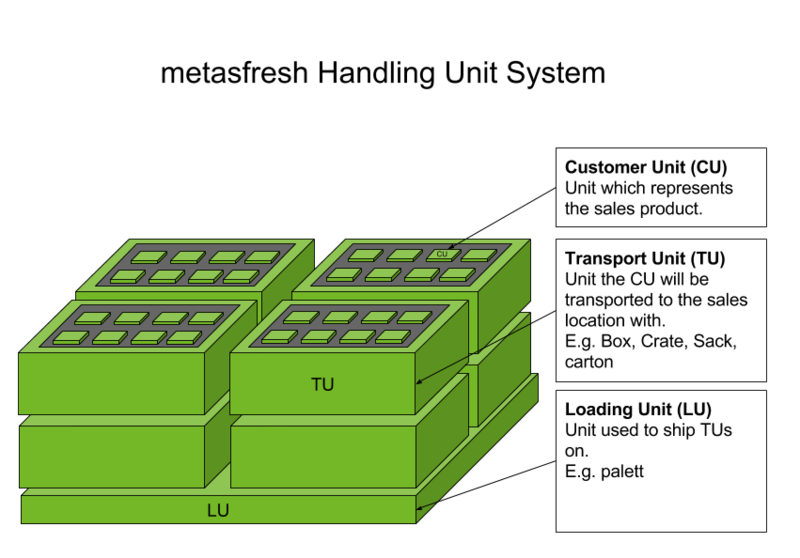 Therefore a CU in a TU in an LU is a Handling Unit. HU|type|example —|—|— CU|Product|Individual pieces (e.g. salad), bulk material (e.g. sand) or Free-flowing goods (e.g. milk) TU|Packaging|Non-reusable crates, reusable crates (e.g. Eurobox, IFCO), put-up hinge, box with individual drinks, etc. LU|Loading aids|Palette, container, Paloxes, etc. CU How to Add a new product? Shows how to create a CU and add several packaging instructions (CU-TU relation).